Preparing for UTMB 2014, I've been looking for lightweight gear to be taken for a journey around Mont Blanc in August. Silva Trail Runner 2 is the lightest headtorch I have been able to find so far, with a sufficient light output of 140 lumens. It weighs only 122 grams including three AAA batteries. 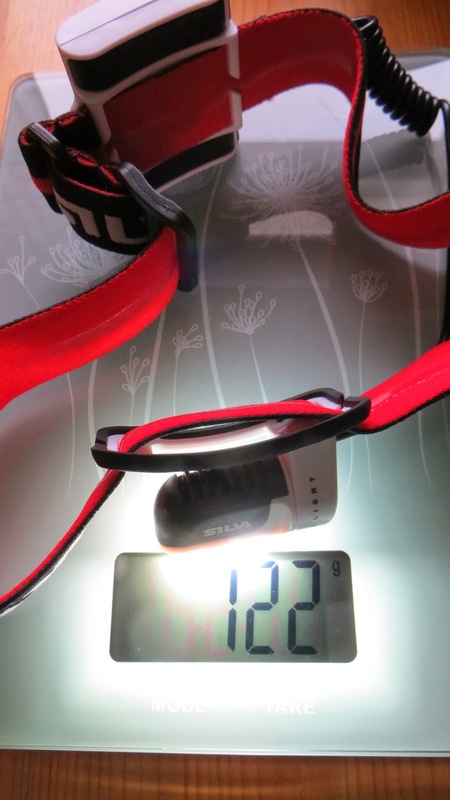 My previous favorite headlamp Petzl MYO RXP (also 140 lumens) weighs 182 grams with three AA batteries. That's 60g. Without batteries the weight difference is not that significant. What, only 122 grams with batteries? UTMB here I come! We also have to keep in mind that the rules of races like UTMB require competitors to carry an extra set of batteries or risk getting disqualified. A set of 3xAAA batteries weighs about 40g less than 3xAA. So the total weight saving with extra batteries is about 100g. That may not seem like a big deal, but with all the other gear it all adds up quickly. In a 168km mountain run (the distance of four marathons), every gram counts. Silva Intelligent Light™: a strong spotlight and a wide floodlight. How about the performance of TR2? I have test-driven TR2 through Finnish winter in freezing cold, below -18˚C (0˚F). Our days here can be darker than nights in the south. So far I'm impressed. By combining a strong spotlight and a wide floodlight Silva lights up the trail ahead pretty well. The light distance is about 45m/20 meters in max/min mode. The beam is actually not that wide, but neither is the trail usually, so it's ok I guess. After turn-off, green light means 'batteries OK'. An orange light gives you some time. Red means you are done. Of course the trade-off between the light output and battery life is something to be considered. Many LED-lamps boast a lot more lumens, but what's the use of all that extra illumination in ultra trail running if the batteries will last only a couple of hours? Silva claims TR2 burn time is 30h/48h in max/min mode. I have not been able to verify this myself yet, but I believe that to be about correct in ideal conditions. That might mean that I might not have to change batteries or torches during UTMB (two nights). However in extremely cold temperatures the burn time will understandably and inevitably be somewhat less than ideal. The 3xAAA batteries are in the back of the headband. You can use rechargeable ones to be ecological and -nomical. I love the simple design of TR2. There is only one button to press and it is large enough. The first pressing turns max mode on. The second press switches to min mode. When on, a long (>1s) press turns the main lights off, but turns on a green/orange/red battery indicator light for a few seconds. When off, a long press turns the flash mode on. That's all: no computer software (which in Petzl case was a buggy piece of crap anyway). Okay let's wrap it up. Buy this good lamp (the price is reasonable, I paid 73€ for mine) and see for yourself. See you in Chamonix in August - I'll be the happy dude wearing a Silva Trail Runner 2! Thanks TP....I will definitely check this lamp out. After running these crazy ultras for 6 years I still haven't dialed in the light situation 100%. There are a couple of things I have learned you might consider however. First, wear a lamp on your waist belt. This is the single biggest benefit I've found when night running on trails. Why? Because the light coming off your head produces zero shadows, while a light below your eye level does. Why is this important? You will have to test this to understand the real benefit. By seeing shadows my visual recognition of the terrain (at night) improves by 30%. Second, use two lamps - one on your belt and one on your head. When doing long climbs, turn your primary light off (you won't need it) and dim your headlamp (get one with a dimmer). This way you never have to change your batteries! Anyway, good luck at UTMB...I wish I could be there but that would be the nail in the coffin of my marriage. Thanks Will! I have read about wearing a headlamp around your waist and using 2 light sources in Relentless Forward Progress by Bryon Powell. Actually UTMB rules require competitors carry 2 headlamps (as you know). So I might try this tip. On the other hand, as you know there can be a long conga line of runners with super-powerful torches in Euro ultras, so in those cases one may do fine with one light. Your excuse for avoiding UTMB is acceptable, but how about PTL in 2015? I'm sure it would be awesome to get lost and risk falling off a cliff in the Alps :-) Good luck for GS100 - you can do it! Reading this review after having asked you for advice feels kind of embarassing ;) Thx anyway! No problem Paul. Silva Trail Runner II worked well in Lavaredo UT. During the 2nd night I had to change the batteries, but we were required to carry spare batteries anyway so no harm done there, took only a minute. It may be possible to finish Chiemgauer100 before sunset, but the main thing is just to finish. Running through a dark night can be kind of awesome in the Alps, especially if it's a clear night. Glad to hear you finally saw the light! :-) Enjoy the race! Good point Will. I use a headtorch plus one round my waist for exactly that reason. The waist one doesn't need to be very powerful as it's only lighting up the ground just ahead of your feet. It's particularly important over rough ground.